"The Flash #6," written by Francis Manapul and Brian Buccellato, comes out on Wednesday. It’s a crossover issue that builds on the pre-existing story and artwork by the always brilliant writer/artist Francis Manapul (“Witchblade,” “Legion of Super-Heroes”). It manages to bring that story to a conclusion and nicely set up issue No. 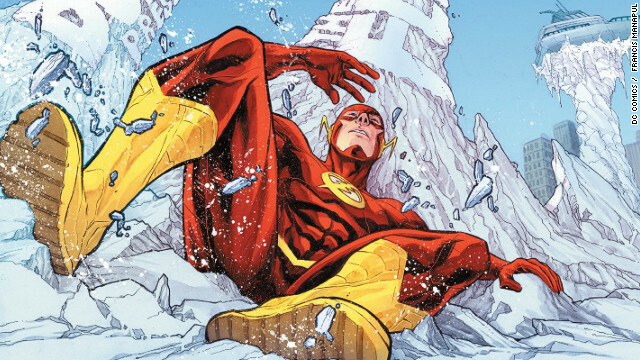 7’s introduction of the New 52’s vision of Flash’s nemesis – Captain Cold. Our friend Daniel Dean from Titan Games and Comics in Smyrna, Georgia, thinks you should read "The Flash” simply because Manapul writes the book. “The Flash” has always been a divisive property, with different incarnations and different “definitive” takes on the character stretching back to the ‘30s. In the end, I think there’s a place for all of them. But the shifting around has understandably rubbed some comics readers the wrong way. I went back and read some older issues of “The Flash.” I found that sharp thinking, a mind for science, and above-par intelligence were always at the heart of the comic. Batman always wants to be better than his enemies. Superman always wants to represent a greater good. And The Flash always wants to be smarter than his enemies - and he wants to win. That's the jock and the nerd rolled into one. I've always been a lukewarm fan of "The Flash." I see this superhero as more an ensemble cast member than a stand-alone hero. But I'm honestly surprised by the new story line. I think a lot of readers feel that way about the New 52 incarnation of "The Flash." He said his opinion shifted when he figured out that the iconic character wasn’t just about running fast. He was about speed of all sorts. “The Flash doesn't just run, he moves and metabolizes and reacts and thinks faster than anyone on the planet, and that isn't just cool, it's compelling,” Dean said. The first five issues of the New 52 version of "The Flash" are an absolute primer on everything that is great about the speedster - his Midwestern setting and blue-collar roots in his secret identity as Barry Allen, and his way of fighting crime both in and out of costume (he was all over CSI before most people knew what that was). The way he adapts to and uses his ever-evolving powers is also on full display. Running is the tip of the iceberg. So, until next week, go forth and read, my people. And the reading will be good! Is there a comic out there that you really love? Let us know in the comments. We’re always looking for tips on good comics! Here are some of the comics scheduled to hit the shelves on February 22, 2012. Your local retailer will probably have these and others, so make sure to check with them for more details. Hey Matt, good point. I have an answer I too would preefr to read an issue in one sitting. But doing that as a release schedule online wouldn't be too smart because you pretty much unload your ammunition. Think of it this way every time you update your site, especially using tags and cool descriptions of what's going on on the page, it shoots out into the internet and draws attention and new outside readers in from all over . Bottom line, you'll grow an audience a bit faster with consistent and often updates. Now here's where you appease the people who want it in one sitting they can wait! Think about it If you've been doing a comic for 6 months and have 3 full issues completed and a new reader comes along, they're going to be able to read 3 full issues all at once. For the people who want to wait to read an entire issue all at once, this would be a great time to get them on a mailing list where you will send an alert to those folks when all of the pages of that issue are available to read. I loved Flash #6, especially the art. Manapul and Buccellato are doing a fantastic job experimenting with their storytelling -written and illustrated. I hope Lisa doesn't die so we can get to see the Golden Glider again. I think Chew is a book that everyone should be reading. It is very clever and just as funny. I look forward to it every month and buy it the day it comes out. I usually read each issue 2 or 3 times just to make sure that I don't miss any of the jokes in the story as well as in the background. Each issue has several "Easter Eggs" included. It's so much fun to read!